Subscribe to our Making invitations Easy Newsletter for ideas + free resources. Now how gorgeous are these homemade bridal invitations. You can use this idea for engagement invitations as well. I don't know why I never thought of using a faux diamond ring as an accent for an invite before now. Thank goodness Candice is here to show us how to make these bling invitations. White paper to print invitation deatails. Rubber Stamp - You're Invited stamp is also from Stampin' Up!. A Cricut die cut machine to cut the scalloped circle - If you don't have access to one you can simply cut your own shape with a shape template or free hand. Create a folded card from the blue card. The front of the card will be embellished and the inside will hold all the pertinent details of the Shower for the guests. I cut the circle and scalloped circle from the Cricut Accent Essentials cartridge. I can't remember the exact dimension of the circle and scalloped circle , but my guess would be that the scallop was cut at 5 1/2"and the regular circle at 4 3/4". I found the little faux diamond ring at Meijer in the wedding department. You could probably find them anywhere that sells wedding supplies. I think they are meant to go on top of cupcakes, but worked perfectly here! 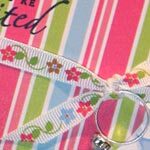 I cut a small slit in the fold of the card and ran the ribbon through and then slipped the ring on and tied the knot to secure the ring at the front. 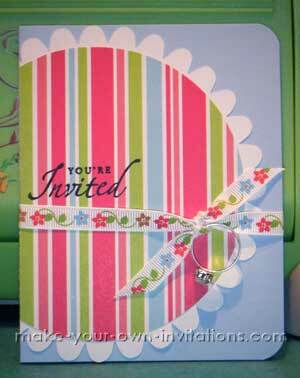 Stamp the words "You're invited" directly onto the cut out circles. You can find these kind of stamps at your local craft store or in the craft section of your department stores. Always check the bargain bins for end of line cheap stamps. For the inside of the invitation I printed the info on white paper and glued it in. The ribbon has a double purpose and works great on the inside to hold the registration cards and map. You can choose to decorate the front of your shower invitation any way you choose. If you do not have access to special paper cutting tools to cut out the scalloped circles you can simply cut regular circles or shapes.